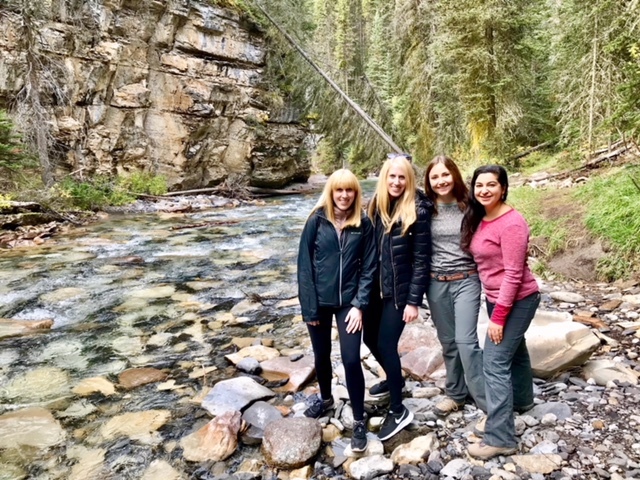 I had been planning to visit Banff for years and finally got my closest group of friends to get it on the fun as well—and let me tell you—it was one of the most beautiful places I’ve ever been. I thought I knew what large mountains looked like since I grew up in Colorado, but after driving in and around Banff—nothing compares. The best thing to do when traveling with a group of friends is to PLAN! We made a massive Google spreadsheet that listed and linked to everything we wanted to do, see, hike and experience. We made lists of what each of us wanted to do, planned out a daily itinerary, researched the heck out of restaurants, and assigned who was in charge of booking transport and lodging. We had all gone on trips together before this, but I think this trip went so smoothly because we planned everything out and didn’t spend 20 minutes trying to decide on a restaurant to go to for dinner each day. I wanted to share with you the things we did and the places we went so you can have as good a trip as I did. Calgary International Airport (YYC) is the closest airport to Banff. Surprisingly inexpensive to fly into and extremely clean! We were all very impressed at how modern and clean this airport was. They have your typical variety of restaurants in the International terminal and I recommend exchanging currency here if you don’t have Canadian dollars. We rented a car since Banff is 1.5 hours from Calgary but there are a few shuttle options that go to and from Banff. Since half my group was staying a few extra days, my sister and I took the Banff Airporter to the airport. It’s around $50USD each way and it’s a luxury shuttle so it’s a little nicer than your average Greyhound bus. We ended up staying in Canmore just 20 minutes East of Banff. When researching lodging options, Banff is more expensive than I had anticipated (averaging $300CAD+/night). We started looking into Canmore which is still a expensive, but more affordable (averaging $250CAD+/night). If you’re looking to be closer to the city of Banff and wanting to be 20 minutes closer to the hiking trails, I would stay in Banff. We stayed at Basecamp Lodge in Canmore which just recently opened in May 2018. It was a perfect location—easy to walk to several restaurants and downtown Canmore. The lodge sadly didn’t have a hot tub or large lobby area, but it did have a sauna and free parking which was perfect for our stay. They also had a continental breakfast that was ready by 6:30AM—perfect for those that want to be up early for hikes. Because everyone in my group made lists of the top things we wanted to do, we had every morning, afternoon and evening planned. Due to weather we had to switch around a few things, but in the end we had fairly solid days jam packed with fun things to do! Lake Louise is located 45 minutes West of Banff and is gorgeous! I cannot stress this enough—get here early—like 7:30am early. There are more parking options here than at some of the other lakes, but the earlier you get here, the less tourists and better opportunity for quieter hikes and pictures. Most lakes in the area are glacier fed making them a beautiful clear teal color that’s ideal for those Instagram pics. The Fairmont Lake Louise is also near the lake and makes for a lovely stroll to see the beautiful hotel. 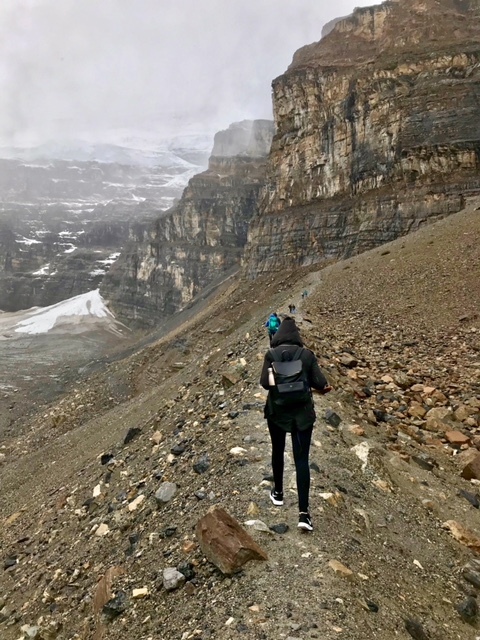 After walking around Lake Louise you will hit the start of the Plain of Six Glacier hike. This 8.7 mile hike is good for beginner/intermediate hikers and took our group around 5 hours (it starting pouring half way down so we took it a little slower). I can’t express how beautiful it is, especially in the Fall! The contrast of various colored rock formations with the changing red, yellow and greens of the plants and trees is a lovely sight! Before the last mile of the hike, you’ll hit a tea house which is perfect for a quick rest, tea and delicious treats. They have a wide variety of teas, cakes and basic meal options (soups, sandwiches). We stopped for tea and desserts and it really hit the spot! It was so nice to just rest for 20 minutes and take in the quiet surroundings. **Tip- they only accept cash here, so make sure to carry some with you. Moraine Lake was my favorite. The beautiful waters, the snowy mountains, the crisp air. It’s honestly so stunning! We got here extra early—around 7:20am because the main road gets closed off when they run out of parking at Moraine Lake—and they don’t have a lot. If the street is closed, you then have to go another lot and PAY to take the shuttle up. So I highly recommend waking up extra early to get a parking spot up here—trust me it’s worth it. If you get there in the morning and the road is closed, they re-open the road around 5PM. We climbed up the Rock Pile Trail to get a higher look at the lake and it’s just so amazing. The color of the water is so unreal that my family asked if I edited the color in my pictures. I can assure you, it’s real. We then went on to take hundreds of pictures before walking closer to the lake where we started to take another hundred pictures. 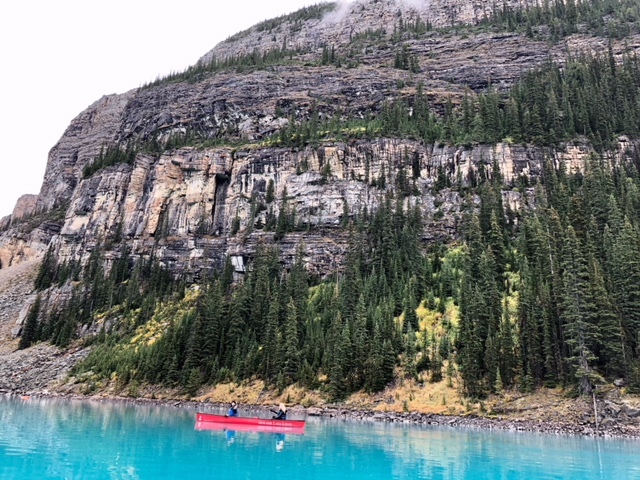 Since the weather wasn’t ideal at Lake Louise the day we went, we decided to canoe at Moraine Lake. After seeing both, I would 100% recommend Moraine Lake. Canoeing opens at 9AM on a first-come-first serve basis. Another reason to get to the lake before 9AM so canoes aren’t in your pictures and to ensure you get a canoe. Each canoe fits a max of 3 people and costs $110CAD. It’s a little pricey, but 100% worth it. It was so nice just to explore the mountains and glaciers a little closer and see the blue water up close. The canoe rentals claim to have a 1 hour limit, but they are very lenient on the time—we spent a little over 1.5 hours on the water and they didn’t have a problem with it! There’s a lodge at Moraine Lake that includes canoeing in their nightly fee, so if you really want to take advantage of Moraine Lake, I would recommend booking a room. Peyto Lake was the furthest West we went. It’s roughly 45 minutes from Moraine Lake. The hike up to the lookout at Peyto is semi-steep, but not too long—less than 1 mile. It was so fun to hike up and slowly see the overlook and then the teal blue water revealed soon after. This, again, is another stunning view. We got here in the late afternoon and it was CROWDED. I imagine there are less people here early in the morning, but it was a good place to do a quick hike and then rest for lunch. Johnston Canyon was the busiest place we came across. Parking is limited and we had to wait in the upper lot for someone who was leaving so we could grab their spot. There is a 1.5 mile hike to the lower falls and another 1.5 mile hike to the upper falls. This is good for beginner/intermediate hikers as well and the paths are well marked. I had come across some amazing images of a hidden tavern on this hike and was actively looking for it. Sadly they were doing “wildlife conservation” in the area that leads to it and closed off access. That was disappointing, but the rest of the hike was lovely and the falls were gorgeous as well. 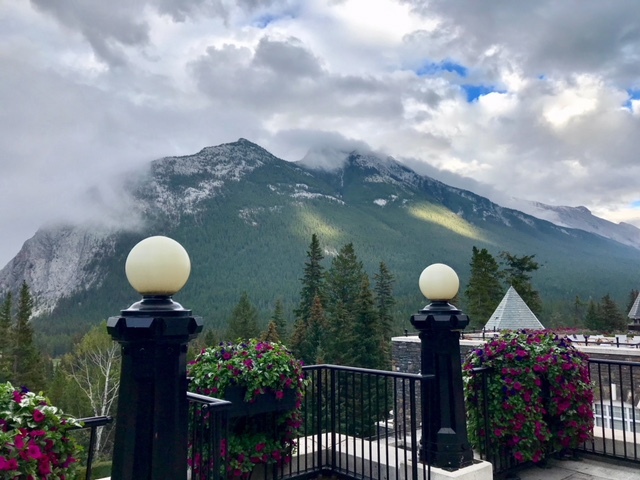 We looked at staying at the Fairmont in Banff after seeing the Fairmont in Quebec City, but it was VERY out of our price range, so we decided to go there after one of our dinners in Banff. It has beautiful mountain views and such history! It was fun to walk around the area. We even treated ourselves to some dessert in one of the restaurants inside—which I recommend if you can’t afford to stay there. We went here for dinner our first night after arriving. The building itself is beautiful—very lodge like and has amazing views of the mountains. The food wasn’t amazing, but the drinks were good. I would recommend coming for a happy hour to enjoy the drinks and views, but go somewhere else for food. Blake was AMAZING! It’s located across the street from our hotel and we heard so many good things about it, we knew we had to make a stop here. The cocktails were my favorite from everywhere else we went on this trip—seriously so good and very easy to drink. It’s a little pricey, but after you convert to USD, it’s very reasonable. The food was well proportioned, healthy and delicious. They also have other restaurants in the area including a double-decker food truck with mountain views that I recommend giving a try! Block was a small tapas style restaurant that was pretty decent. The portions were a little small with above average prices, but my sister and I shared the fries and smoked bison flatbread and it was very tasty. Not the best venue for large groups (there were 6 of us and we had to wait 1 hour before being seated). While we were waiting for our table at Block, we went to Park for drinks. Park distills their own gin, whiskey and vodka and their decor is so Canadian…I was living for everything in that restaurant. We liked the drinks and atmosphere so much we went back our last night for dinner and it was delicious! Larger portioned plates with several gluten free options and fish that’s always caught than 11 hours before—I had the Salmon and quinoa bowl—it was so good! Good for large groups and great main street views. Most of the shops in Banff are either gift shops or clothing shops that most places have (Lulu Lemon, Roots, H&M, etc..), but I preferred shopping around Banff more so than Canmore. Canmore was nice to walk around and see the local shops, but Banff had more to see and do. You NEED to purchase a park pass. Banff and all the surrounding hiking trails are part of Banff National Park, which requires a park pass. You can purchase online beforehand or at ticket booths on the highway (roughly $20CAD per day for a 4-7 person car). Rent a car. A lot of people try to shuttle their way around, but it’s honestly SO much easier with a car. This way you can set your own schedule and don’t have to worry about not having enough time somewhere because you had to get the last shuttle. Be adventurous with the food! I love visiting new places and going to local restaurants. When I first perused the menus, I thought everything was so pricey, but you have to keep in mind the exchange rate. It’s cheaper for Americans (yay!). Explore Cascade Gardens! I saw this come up on a couple sites as a beautiful fun free thing to do in Banff. Sadly, we didn’t have time and only drove past it, but from the outside it looked gorgeous! Don’t do it for the Instagram. 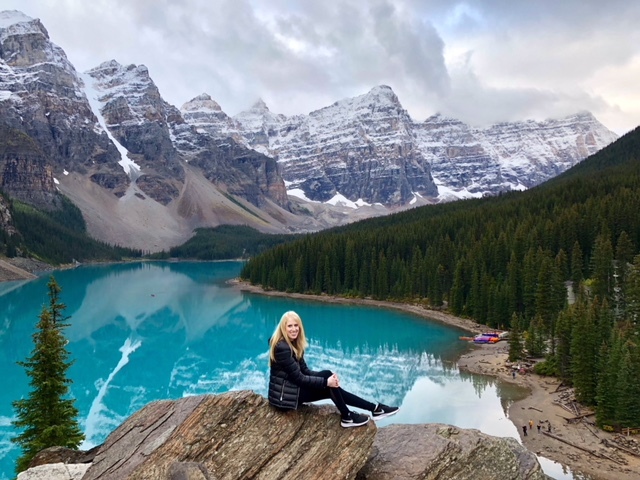 I found a few places I wanted to check out in Banff only because it looked cool on Instagram—come to realize I spent so much time trying to get the best shot or find the right angle, that I didn’t appreciate where I actually was. Don’t worry about getting the best pic and just remember to live in the moment. Pack for all kinds of weather. You have to remember you’re at a higher altitude, so just because it may be warm, doesn’t mean it will stay warm before and after the sun has set. I was used to this just from growing up in Colorado, but you also NEED to bring SUNSCREEN—you’re closer to the sun and more likely to burn. Best warm weather travel is May-August. Fall colors can be seen from September-October and Winter lasts from October-April. I can’t say enough good things about Banff. I definitely want to make an annual trip there during other seasons because I seriously loved it so much! Visit my Instagram page for videos from when we were there. Hopefully this guide helps you with your adventures in Alberta and feel free to leave a comment below with other recommendations or questions you may have.